McDonald’s advertises its McCafé Mobile Rewards in a new commercial, highlighting that when you buy 7 hot McCafé beverages, you can get the 8th medium free. “The only thing better than a free McCafé coffee is a free McCafé specialty coffee,” the voiceover says on the 15-second spot, introducing the McCafé Mobile Rewards. 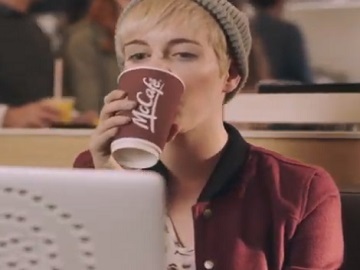 “Buy any 7 hot beverages and your 8th is free,” adds the voiceover, urging viewers to get the My McD’s app today. In order to use the McCafé Mobile Rewards feature, you must first download and register the My McD’s App and scan your McCafé Mobile Rewards card in the Mobile Offers section of the app when you order a hot beverage. Once you’ve earned 7 mobile stickers, you’ll receive a free medium hot beverage of your choice. To redeem, scan your “Free medium hot beverage” offer found in the Mobile Offers section of the My McD’s app. The McCafé Mobile Rewards can be redeemed at the front counter, kiosk, drive-thru and even when you order ahead on Mobile Ordering. The free hot medium beverage you can get is Premium Roast Brewed Coffee, Latte, Americano, Deluxe Hot Chocolate, Tea, Cappuccino and Mocha.